The French were the first to set foot in modern day Maine, forming a settlement on St. Croix Island, a small island off the coast of the state, in 1604. They formed a permanent trading post in Castine in 1613, whilst a rival post was set up by English colonists known as the Plymouth Colony, near Penobscot Bay in the 1620s. Sir Ferdinando Gorges and John Mason were given a land patent in 1622 for modern day Maine, and in the 1630s, settlements began popping up along the Maine’s southern coastline. During the American Revolution in the late 1700s, Maine was a hotspot for American patriotism and used their large shipbuilding industry to support the colonists’ war efforts. Maine created their state constitution in 1819 and shortly later in 1820 was granted statehood from Massachusetts. The state became a centre for industrialization in the 1800s as well; lumber, shipbuilding, textile, and paper industries expanded across the state while the agriculture in Maine also flourished. During the Civil War, Maine strongly supported the Union cause, seeing as Hannibal Hamlin, Abraham Lincoln’s Vice President, was from the state. Many residents joined the Union troops, and in relation to their small population size, contributed the largest proportion of troops of any state. After the war, Maine saw an influx of immigrants from Ireland and French Canada because of their booming industry. Tourism also became a large part of the industry in the mid-17th century because of its pristine coastlines and beautiful scenery. In modern Maine, Kennebunkport is most notable as the location of the Bush family’s (former Presidents George H.W. and George W. Bush) country home. In the early 1900s, the majority of Maine’s population lived in the countryside, though there were some booming urban centres. Portland and Lewiston joined the ever-growing automobile industry and the production of radios, washing machines, and other electrical appliances also contributed to the cities’ success. Electrification of farm work aided agriculture after WWII; the number of farms increased and dairy farming became more widespread. Environmental reform also became a strong part of Maine culture, with the state leading the charge against air pollution in the 1980s. Modern day Maine is one of the US’s leaders in environmental legislation. With comprehensive waste and reuse legislation, there is low pollution and the state owns and preserves much of the wild land. Maine is considered one of the least religious states in the US; however, of people who identify as religious, the majority are Roman Catholic, followed by large groups of Baptist and other Protestant groups. 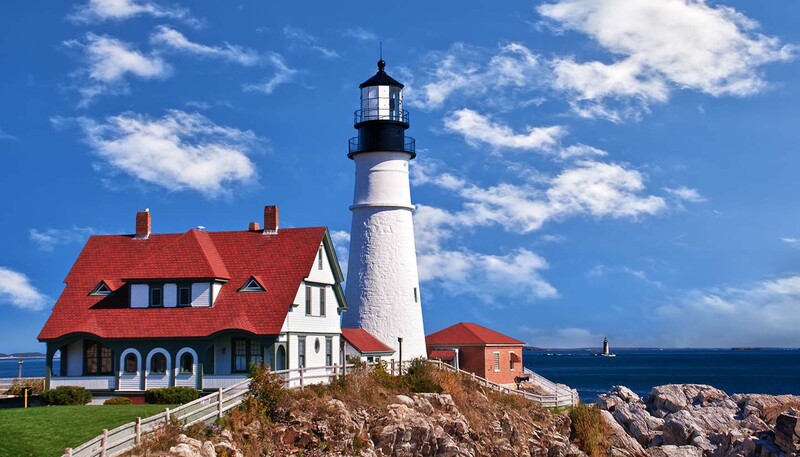 Known as "Vacationland," Maine witnesses a large population increase during the summer months as visitors flock from across the US and around the world for the state's beautiful coastline and beaches. Areas like York, Kennebunkport and Kittery are all popular destinations (among many others) for summer holidays. Maine does not have an official language, but like the rest of the United State, English is the most widely spoken and used language. Maine is also home to a fairly large French speaking population, with smaller groups of Spanish, German, and Chinese speakers, among several other languages.